Vincent Price, Roger Corman, and Edgar Allan Poe rebound nicely in their second teaming after the deadly dull House Of Usher that came out the year before with a picture that finally delivers on the whole “haunted castle” gimmick. It isn’t really haunted of course, but you’ve got deception, betrayal, madness, secret passages, and most importantly of all, a working torture chamber down in the basement! In fact, at the very beginning, Vincent Price’s character Nicholas is down there making sure that the giant swinging ax is all oiled up and ready to go should he suddenly go crazy and feel like strapping some dude down and ruining a perfectly good dress shirt. Besides benefiting from a more suitable hair color this time around (I don’t think you have to be an English major to guess that Poe never mentioned in his Usher story that Vincent Price had peroxided his hair and if by some freak chance he did, that was probably a lot more chilling on the page than it was in the movie), Price actually has something to do instead of just moping around about how cruddy his family is and how he’s really sensitive to rough clothing, bad food, and poor lighting. Don’t misunderstand, Nicholas’ family is still pretty crappy as far as sixteenth century Spanish families go, it’s just that Nicholas is able to channel all his hangups into an entertaining package of denial, creepy obsession, and eventually murder! Francis Barnard arrives at the Medina castle in search of news regarding his sister, who is married to Nicholas. He received word in London that she had died, but had not been given too many details regarding the cause of death. Francis shows up a lot more steamed than you would expect from a guy named Francis and spends the entire movie with a perpetual scowl affixed to his face. This was nicely complimented by a generally crabby disposition and a bowl haircut. Besides Nicholas, his sister Catherine lives at the castle. She doesn’t really serve much purpose in all this other than to tell Francis the secret origin of her demented brother. Also hanging around is the doctor who pronounced Francis’ sister dead. He’s a young stud which immediately raises a red flag because the only time the doctor isn’t an old timer in these types of movies is when the doctor is either the hero or the guy who stole Vincent Price’s wife, faked her death, and is trying to drive him insane so they can be together. The stud doctor is no brain surgeon though because his little scheme is screwed up when Elizabeth (the supposedly dead wife) decides to start haunting Nicholas while Francis is still hanging around. But why are they trying to drive Nicholas insane in the first place? He thinks she’s dead. If she and the doctor want to be together, can’t they just run off to somewhere where no one knows who they are and start over? But let’s say they want to drive him insane so that they can be together without moving. How do they explain to everyone that she is suddenly alive again and why did Nicholas go insane thinking that she was haunting him? What’s the point of everything once the death had been successfully faked? Not being one to let a little logic get in the way of some cheap thrills, this didn’t bother me as much as it might have since once Elizabeth returns and sends Nicholas over the edge, things picked up in a hurry. The best scene in the movie was when Nicholas went into this catatonic state after witnessing Elizabeth rising from her tomb and then getting taunted by her about how everyone in his life is a no good adulterer (mom, uncle, wife, best friend) and she’s cackling in his face about it and we’re just waiting for Nicholas to do something that will make him the subject of a two hour long episode of Dateline. When Nicholas finally starts laughing back in her nasty face, it’s one of those crowd-pleasing moments when you stand up and cheer and start chanting “adulterer” over and over as Nicholas makes his comeback, rising to his feet and chucking the faithless Elizabeth into the iron maiden while Dr. Stud takes a header down into the pit the pendulum is suspended above! 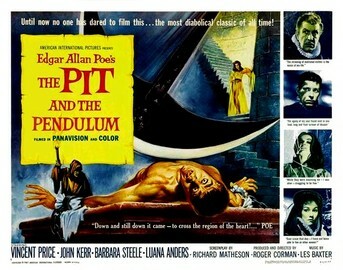 The pendulum doesn’t get hardly any play in this movie, not actually even appearing until less than ten minutes from the end. It’s not a fatal flaw though since Corman delivers a nice looking film as well as villains that are easy to hate in Dr. Stud and Elizabeth. Price is also very good, managing to generate enough sympathy with what he’s been through that once he snaps, you aren’t rooting against him, so much as rooting for him to get on some meds and into some counseling.